جهت دانلود کتاب The NALCO Water Handbook 4th Edition با ما مکاتبه کنبد. کتاب The NALCO Water Handbook 4th Edition پس از واریز هزینه ارسال میشود. ایبوک 113806243X در آرشیو گیگاپیپر موجود است. تصفیه آب از تصفیه مقدماتی تا تصفیه نهایی است. این کتاب مرجعی کاربردی و پایه برای استفاده مهندسان طراحی و شیمیست های دست اندرکار در صنعت تصفیه آب است. This industry-standard resource from the world’s leading water management company offers practical guidance on the use and treatment of water and wastewater in industrial and institutional facilities. Revised to align with the latest regulations and technologies, The Nalco Water Handbook, Fourth Edition, explains water management fundamentals and clearly shows how to improve water quality, minimize usage, and optimize treatment processes. Throughout, new emphasis is placed on today’s prevailing issues, including water scarcity, stressors, and business risk. شرکت ” NALCO ” یکی از شرکت های معظمی است که با سابقه در حدود ۹۰ سال در زمینه سیستمهای آبی (تصفیه آب و مواد شیمیایی مربوطه) فعالیت می کند. 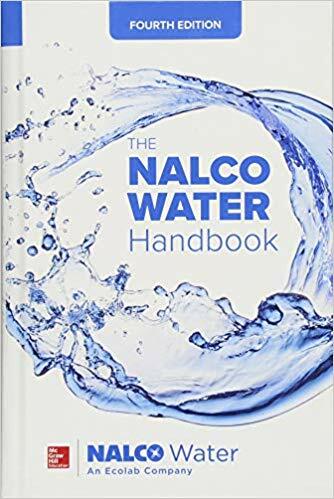 هندبوک آب (The Nalco Water Handbook) این شرکت یکی از بهترین مراجع و راهنماها در زمینه سیستم ها و تجهیزات تصفیه کننده آب و نیز دستگاه های استفاده کننده از آب تصفیه شده (مانند دیگ های بخار ، توربین و …) می باشد . NALCO, an Ecolab company, is the global leader in water, hygiene, and energy technologies and services. NALCO delivers comprehensive solutions and on-site service to ensure safe food, maintain clean environments, optimize water and energy use, and improve operational efficiencies for the global food, healthcare, energy, hospitality, and industrial markets.